This is definitely a gig not to miss. Comparisons may well be odious, but I think Nneka has oodles more talent than Asa, who was always a little one-dimensional. Check one of her videos here. That's not very gracious of you Jeremy. Compare but do not denigrate one because you seek to promote the other. They are both good artistes andn performers. Comparisons are indeed odious and your comparison is totally unnecessary. Its perfectly ok to not like someone. I saw Asa when she was an unknown at Jazzville in Lagos in 2003. Her voice is limited, her music very samey (a Macey Gray replicant). I'm not sure why anyone has a problem with someone not liking a particular type of music, especially when its on the basis of apparently universal popularity. Its perfectly fine to not like a singer. I guess I find it irritating - the herd mentality that can crop up around someone or thing. 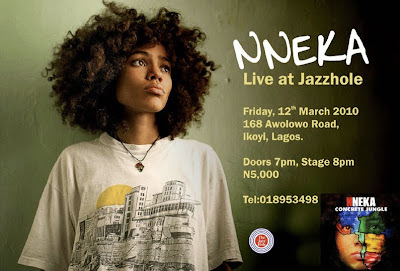 In terms of talent, Nneka has a lot more going for her. But then I guess the relationship between talent and fame was always complicated..
kai! jeremy! na wa for u oh! lol!!! there is hope for me yet.. I kind of agree wit J... Not to say Asa isn't talented. But I just wonder whether her next album isn't going to be more of the same kind of music we all know her for. Jeremy you can;t explain this away. It was in poor tatse. Of course, Asa is not one-dimensional. If you've seen her performance, it might open your eyes a little. But of course you are jeremy, you discount realities that dont fit your theories. No one here has said anything about her popularity. So your raising it is just plain silly. Asa and Nneka fly on different tangents. Why would you compare them in the first place - simply because they are Nigerian? Sade and India Arie remind me of Asa and Nneka - and both rock in different ways, for different reasons. I would say you should keep your odious comments to yourself, but unfortunately, opinions are like armpits. There is so much information on Nigeria in 1948. I love the old reels on Nigeria but cant seem to fing very many. Prefer Asa, this one is talking, not singing! Well how the heck was it?? ?